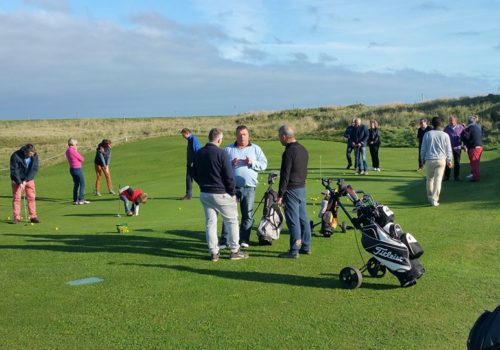 The « Golf de la Presqu’ile » regularly organises open « discovery » days to encourage newcomers to play. These open discovery days are often on a Saturday. A whole day immersed in the exciting sphere of golf and to get you started, clubs in hand. Learn to appreciate the pleasures of this sport played all over the world. Learn to identify obstacles such as bunkers, the rough, water hazards…, and to observe the speed and direction of a ball on the green or after a good practice swing…. The conversations with club members who will be with you during this day of discovery will help you understand the basic rules and how our club works. We meet up at the club house at 9am or 2pm and start with a cup of coffee and a presentation on golf and the main rules of the game. This is a good time for any questions you may have. Then you will be directed to the driving range where players practice their swing. This is your opportunity to hit a few balls. you can play a couple of holes.